Although pretty harmless, ants can be a menace in your garden. Left unchecked, outdoor ants can damage your lawn and even bite you or your pets. You really don’t want colonies of ants taking up residence in your backyard this summer! In this article, we’ve reviewed five of the very best outdoor ant killer products that are on the market today. We’ve also included lots of useful information to help you rid your yard of ants for good! Here are five of the very best outdoor ant killer products we could find in today’s marketplace. Click on the links to see a full specification of each product, read reviews left by other customers, and to place your order when you’ve found the perfect outdoor ant killer for your situation. Terro is one of the best-selling outdoor ant killers on the market. The product is a bait that uses borax mixed with a sugary liquid. Place the bait stations close to the nest or on ant trails and wait for the ants to carry the bait back to their colony. The product works on most species of ants, including fire and carpenter ants. An entire ant colony can be eliminated within 24 to 48 hours. The bait is weatherproof and can also be in your garage, basement, etc., as well as in your yard. You need to check the bait regularly and monitor insect activity. Bifen is a very powerful, protein-based granular bait that kills ants and other outdoor insect pests. The main active ingredient works by targeting the nervous system of insects that ingest the bait. This product is ideal for widespread ant problems and is often used by commercial pest control companies. Bifen granules are designed for outdoor application only such as lawns, turf farms, golf courses, parks, sports fields etc. Ready to use granular insecticide. The granules are easy to spread. The product kills many different garden pests, including fire ants, ticks, and moles. The active ingredients are potent and highly effective. These granules are toxic to people and pets. The product also kills beneficial insects such as bees. Amdro is a bait that works by disrupting energy production in any ants that eat it. The product also contains a slow-acting insecticide that allows worker ants to get back to the colony and feed the poison to their queen. The granules can be used to set up a perimeter around your home, preventing outdoor ants from venturing inside. Amdro is easy to apply and isn’t messy like some products. The product works very effectively on multiple ant species. The results are not immediate, and some ants even learn to avoid the bait granules. You may need to invest in additional spreading equipment to distribute the granules around your backyard. 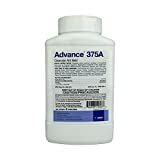 Advance bait uses a particular formula containing protein-based attractants to draw a wide range of ant species to the bait. The slow-acting poison in the bait is abamectin. Although abamectin is non-toxic to people and pets, it can kill beneficial insects such as bees and butterflies. The bait is easy to apply. The product can be used to kill multiple species of ants. You’ll need to buy some spreading equipment to distribute the granules effectively. Some users report that the product isn’t very powerful against carpenter ants. Ortho is a dust-type insecticide that’s specifically designed to tackle fire ants. This product is intended for use on the ants’ nest, killing the queen and destroying the colony. For best effect, use the mound treatment in tandem with Ortho Broadcast Ground Protector. The poison kills the queen and destroys the whole colony. The product can treat up to 162 nests, making it great value for money. Some users report that the product stinks, making it unsuitable for use in areas such as patios. The dust is blown around by the wind, meaning that you’ll need to reapply it regularly. What are the different outdoor ant species? There are thousands of ant species that are found across the U.S. However when it comes to annoying householders; it is fire ants and carpenter ants that usually are the main culprits. Carpenter ants are typically found outside the home. This species of ant nests in and around wood, especially if the environment is damp. That’s why you’ll see carpenter ants setting up a colony around rotten trees. If you have a woodpile or wood store in your yard, you might see carpenter ants close by. You can recognize a carpenter ants’ nest by the appearance of small piles of sawdust close to it. Carpenter ants are glossy and black and are larger than other species of common garden ants. Male carpenter ants have wings, as do queens. In the spring when the weather warms up, you’ll see carpenter ants taking flight in huge swarms as they search for somewhere to set up a colony. If you discover carpenter ants in your backyard, you should act quickly to get rid of them. Left to their own devices, carpenter ants can burrow through into your decking or even into the wooden foundations of your home. Fire ants are not the kind of guest you want to find gatecrashing your barbecue! These tiny red ants are aggressively protective of their nest and have a very nasty sting that can be extremely painful. Fire ants live in massive colonies 250,000-strong, presenting a very real danger to small children and pets. In people with a severe allergy to the ants’ venom, fire ant stings can cause anaphylaxis, which can be fatal if not treated promptly. Fire ants can cause damage to the wiring around your home as they forage in search of food. Also, these nasty little critters will head indoors, increasing the risk to your family and pets. A fire ant colony is usually hidden deep underground, but you can spot the telltale signs of a nest by the fluffy appearance of the soil around the area. Also, you’ll see that, unlike other species, the fire ants’ nest has no central entrance. Ants should not be confused with termites. Termites are a home invader you need to send packing right away before your home sustains serious structural damage! To find out how to tell the difference between the two species, check out this informative article. There are several different types of outdoor ant killer. The most effective products contain a slow-acting insecticide such as borax. Ants that eat the baited killer take the poison back to feed the colony, eventually infecting and killing the entire nest, including the queen and larvae. So, what are the different kinds of outdoor ant killer that you can buy? Gel and liquid ant killers use a sweet solution to attract the insects to the bait. Gel baits are perfect for treating problem areas such as hard-to-reach cracks and crevices that can’t be accessed with granules or traps. Liquid and gel baits are typically dispensed via a syringe. You simply squeeze the bait into the area you want to treat, and you’re good to go. The worker ants collect the poison bait during their foraging trips, taking it back to the colony as food for the queen and her larvae. Granular bait is designed to be spread across your lawn, particularly targetting ants that are making a mess of your grass. Dust ant killers are usually made from Diatomaceous Earth (DE). The dust works by dehydrating the exoskeletons of the ants, killing them. The main drawback of dust outdoor ant killer is that it tends to be washed away when it rains or get blown around when it is windy. You can use liquid and aerosol ant killer to create a barrier around your home, deterring ants from venturing into your house from your yard. You can either spray the product directly onto the trail of foraging ants or apply it to form a barrier around the perimeter of your property. When choosing a spray ant killer product, you must pick one that’s effective against the specific species of ant you have in your garden. There are a few things that you’ll need to consider when selecting an outdoor ant killer. If you live in a state where you have a lot of rain during the spring and summer months, you’ll want to choose something that’s weather-resistant. Similarly, if you live somewhere exposed and prone to windy weather, don’t pick a powder or a dust product that will quickly be blown away. Do you have children and pets? If you do, you’ll need to choose a product that’s non-toxic and safe to use around them. Ant traps might be the best bet if you’re a pet owner because the bait is held inside a plastic container where animals can’t reach it. If you can identify the species of ants that you have in your garden, be sure to choose a killer that will be effective against them. For example, not all ant species are attracted to protein-based baits, preferring sugary foods.Check the labeling on your chosen product carefully to be sure it will kill the species of ants that are causing problems in your garden. What chemicals do outdoor ant killers contain? The active ingredients used in ant killer products vary somewhat between manufacturers, although there are a few common denominators. Many ant killers contain naturally occurring boric acid and other borates. Also, you’ll see the insecticides methoprene and pyriproxyfen included in some ant killer products. When used in ant killers, both these chemicals work by restricting the insect’s growth, stalling their development and ultimately killing them. Other common constituents of ant baits are avermectin, neonicotinoids, and hydramethylnon. Ant killer sprays tend to use a different formula and different ingredients than bait-type killers. That’s because sprays are designed to kill on contact with the pest, rather than slowly. Sprays often contain naturally occurring substances that also act as deterrents. Botanicals such as hot pepper extract, thyme oil, clove oil, Linalool, and limonene are commonly used to good effect in outdoor ant killer sprays. In this section of our Guide, we’ve provided answers to many of the questions posed by people who are plagued by ants. If you don’t see the information you need, drop us an email, and we’ll try to help you out. Q: Does vinegar get rid of ants outside? A: Ants hate vinegar, so yes it can work as a good repellant if you want to go the DIY route. Make up a 50/50 solution of water and vinegar and put it into a spray bottle. Spray the water and vinegar mixture directly onto the ants to kill them outright or spray outside your exterior doors to deter ants from coming into your home. Q: How can I kill an ant colony in my backyard? A: To eradicate an ant colony, you must kill the queen. That’s tricky as the queen stays inside the nest at the center of the colony. Once you’ve found the nest, use an outdoor ant killer or bait to target the colony. Once the worker ants have picked up the bait and taken it inside the nest, they’ll use it to feed the queen and her larvae, quickly killing her and removing your problem. Q: Can a colony of ants survive without a queen? A: Without a queen, a colony will only survive for the lifetime of the worker ants. That’s because the queen is the only one who lays eggs. With no eggs, no new workers are added to the colony. Worker ants are sterile and cannot reproduce. Therefore, once the queen is dead, the colony will eventually die out. Q: Do the ants in my backyard carry disease? A: Although ants won’t give you a disease by biting you (like mosquitos), they can still spread disease through their feces. Disease-causing organisms, including Streptococcus, salmonella, and staphylococcus have been discovered on some species of ants. So, you really don’t want these pests crawling around your barbecue or hiding in your salad. A: Almost all species of ants can bite or sting you. However, very few cause a significant local or systemic reaction in people or pets. That’s because the majority of ants are too small to inflict a bite on a person or their sting is so mild you’d barely notice it. That said, the bite inflicted by fire ants and harvester ants can cause unpleasant symptoms and may lead to severe allergic reactions. If you have ants in your yard that you want to get rid of, the best way to do it is by using one of the top-quality products we’ve recommended in this guide. 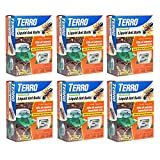 Our favorite product is Terro 6 Pack Outdoor Liquid Ant Baits. 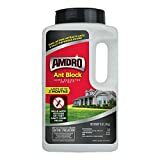 This outdoor ant killer gets rid of your ant problem in up to 48 hours, taking out the whole colony, including the queen. The bait works on many species of ants, it’s weatherproof, and it can also be used in other areas such as your garage and basement.